I finished spinning and Navajo-plying one bobbin of this last night while watching the Olympics. I'm letting the second bobbin 'cure' till tonight when I'll ply it while rooting for Team USA. This is 'Purple Mountain Majesty' (I think; it could be Frosted Fields. I need to keep better records . 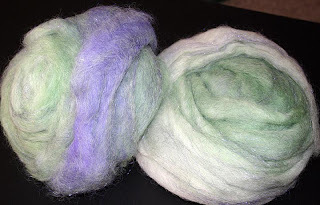 . . ) from Spinderella's Fiber Mill in Utah. 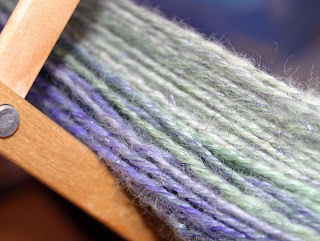 One bobbin, about 60% of the 8 ounce roving I started with, gave me approx. 160 yards of 3-ply yarn. 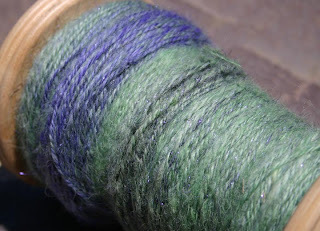 (ETA: the second bobbin gave me about 100 additional yards of 3-ply.) My spinning is still more inconsistent than I'd like, but the 3-ply technique evens things out and makes it look pretty. I loved spinning this stuff and I love how it sparkles in the sunshine. Good thing I have more Spinderella's in the stash or I'd be off on a buying spree right now.